Through acts of subjective artifice, interpretation imbues the immaterial with tangible qualities. Yet what are the bounds of these forms, the scope of their influence? This paper probes the representational artifacts of materiality and emergence. Variously conceived, noise serves as a heuristic device through which music is read and representation proposed. Music is inscribed between noise and silence, in the space of the social codification it reveals. The above epigraph from Jacques Attali’s Noise (1985) invites a more exhaustive unpacking than will be offered here. In place of a historiography on what constitutes music, noise, or how conceptions of one shapes an understanding of the other, this paper instead accepts a multivalent noise and immediately engages music as “the audible waveband of vibrations and signs that make up a society” (Attali, 1985, p. 4). If music “reflects the manufacture of society” as Attali (1985) proposes—a sociocultural context music acts within and upon—then does music not condition those signs it makes apparent? In this elaboration, Bohlman does not openly privilege one aspect of his paradox over any other. However, Bohlman’s description animates his musical textText, object, body, and image are used interchangeably. in a manner that suggests subtle bias. Presupposed in any instantiation of subjective quality is its own genesis, the operative action that enables its emergence and may reflexively condition the context in which it signifies. These dynamics—of ontology, stasis, and motion—recall the work of Georges Bataille. Specifically, Bataille’s informe (formless) establishes a priority for incitation over specification. A “performative” act (Bois, 1996, p. 29), informe presumptively revokes the transcendence of the abstract.“Abstract” refers to a subjective quality, an object’s sociocultural positioning. In a return to the worldly—the empirical—informe provokes confrontation between some quality we observe and those implicit possibilities not initially expressed. Through this discord informe induces noise: a renewed awareness of the object’s inherent indeterminacy compels the observer to reevaluate its qualitative positioning. Michael Richardson (1994, p. 51) proposes that Bataille intended to revitalize “intellectual enquiry” in this emphasis on action over signification. In this spirit, noise and the activity that engenders it is of foremost concern to this study. This paper seeks a conceptual space to consider the representational artifacts of materiality and emergence. The ensuing discussion offers a view of music, sound, and text as homologous. Probing the limits of these objects’ notation elucidates aspects of the expressive practices that draw upon them. The pairing of object and its description is seen as oppositional and a locus of activity. Metaphoric noise both initiates and emanates from this activity with imprecision being its most structured form—the one most immanent to expression. Whether by assumption or prescription, noise can be agentic, acting to affect the subjective content of the musical text. Unsuk Chin’s Akrostichon-Wortspiel serves as a culminating reference in this discussion as its textual complexity and conceptual inclusivity aptly illustrate the ideas outlined above. In terms of a material conceptualization of sound (exclusive of the attributed or perceived musicality therein), Pierre Schaeffer’s objets sonores may be the most enduring. While luminous, Schaeffer’s formulation also carries constraints that occlude the interpretive field of view. One appropriation of Schaeffer’s sound object can be found in Aaron Helgeson’s phenomenological reading of music by Salvatore Sciarrino. Appropriately, Helgeson operates from a position that accepts the intentionality of objects existing “in nothing more, or less, than our experience of them” (Helgeson, 2013, p. 5). While conformant to what Schaeffer (2004, p. 81) describes as “an objectivity linked to a subjectivity,” such empiricism is too limiting for present purposes: emphasizing abstraction—stasis—isolates the reader from the object’s other inherent qualities. The rupture Cox espouses gives primacy to an object’s actions while nullifying its subjective qualities. Superficially, this orientation seems to align with Bataille’s informe. However, this exercise is less productive: abrogating signification renders the performance silent. Nevertheless, allure remains in the activism of Cox’s sonic materialism as just beyond its compass lay accommodations for subjective consideration. The position Brian Massumi puts forth in Parables for the Virtual (2002) likewise emphasizes the ontogenetic processes that shape emergence. Massumi also criticizes exclusively semiotic analyses for overlooking “the expression event—in favor of structure” (p. 27). Despite these positions, Massumi makes allowances for signification and interprets the qualities an object expresses as discrete positions along a continuous path of activity. In one step towards reconciliation, Massumi offers the concept of transduction: “the transmission of an impulse of virtuality from one actualization to another and across them all [….] the transmission of a force of potential…” (p. 42). An intermediary stance, transduction accounts for the “forces, intensities, and becomings” Cox (2011, p. 157) privileges while not invalidating the interpretive contribution of extant signifiers. From actions that unfold in the virtual, transduction sets the actual aloud. A materialist view of textual language can be found in perspectives rooted in the aural. Numerous scholars working in sound and musical studies note the concordance between their respective practices of interest and those of nonsense verse and sound poetry.See Cassidy (2013), Cox (2011), Priest (2013), and Bauer (2012). Given Ligeti’s relationship with Chin, the latter’s insights are worth noting. For Cox, sound poetry epitomizes a disruptive radicalism sympathetic to his own disengagement with representation. This communion is poignantly illustrated in Cox’s quote of Steve McCaffery—“from phonic to sonic”—and his implicit approval of Saussure’s exiling such material from “the realm of signification” (2011, p. 154). A countering view is offered by Aaron Cassidy in his quote of Brandon Bell who identifies a “‘[yearning] for language by rupturing the very coherence of it’” (Cassidy, 2013, p. 45). Instead of interpreting neologisms and linguistic plasticity as so deformational as to be only a performative force, Cassidy qua Bell reads it as communicative in the most subjective sense. The sociocultural context is key as it is presupposed. That context begets the process of becoming and therefore—as Attali notes—its product is a reflection of that social order. Regardless of how we define an object or the degree to which we privilege a phenomenological experience of its constitution, exfiltrating a text from its environment abandons all that which the context encodes within it. These encoded artifacts are informative. They do not comprise the object but convey something about it: information. Not itself manifest, information is what Katherine Hayles identifies as “a pattern rather than a presence [….] constructed never to be present in itself”This assertion corresponds with the understanding of Gödel’s theorem recounted in Chen (2004). (1999, p. 25). A synthesis of pattern and absence—or “hyperreality” after Baudrillard (Hayles, 1999, p. 249)—musical notation falls under the taxonomy of information. Notation serves as the simulacrum of an action space in which objects and events are descriptively reified but never actualized.Notation applies equally to examples of Western musical notation, recorded sound, written text et al. What of the relationship between notation and the notated objects’ creation? Daniel Siepmann suggests “direct contact between the thoughts of the composer and the notated musical gestures on a score. They are flush with intentionality, focus, and human creativity at every moment of inception and execution” (Siepmann, 2010, p. 182). While notation likely captures some intentionality, the extent to which it does so remains debatable.To provide just one example, Bohlman (2005, p. 214) writes, “Ethnomusicologists have a tendency to distrust notation as an inadequate or misleading sign system…” Trevor Wishart (1996, p. 23) openly critiques notation as imposing “a finite state logic” upon the musical objects it describes. Wishart maintains that sonic objects ideally exist in a continuum of infinitely possible quality, whereas notation fixes objects upon a lattice of quantized values—a discrete, imprecise representation of a continuous domain.In deference to Wishart, digital systems are constrained by similar lattices where noise can result from a lack of precision, an inability to fully represent a continuous signal in a discrete, mediated form. Regarding intentionality, Wishart suggests that the lattice can impose a presupposition on inception: objects intended to be described in notation will qualitatively conform to its limitations and the composer’s “conception of what constitutes a valid musical object” (Wishart, 1996) follows suit. In the subjugation of sound to signs in notation, the hyperreal “does not merely compete with but actually displaces the original” (Hayles, 1999, p. 250). Ascendant, notation asserts presence and its components assume the capacities for action and signification. On matters of notation in contemporary concert music, the praxis of composers labeled, New Complexity, may be the reference de rigueur. Writing on the music of Brian Ferneyhough, Stuart Duncan suggests that few observers “are able to look beyond […] notational complexity” (Duncan, 2010, p. 141), the dominant and often singular trait invoked in characterizing this music. While notation does encode within it some descriptive information about the music, Duncan intones Franklin Cox to remind the reader that “‘the precise meaning of notational and rhythmic symbols is not […] unequivocal’” (Duncan, 2010, p. 152). This observation compels the ethnographic acknowledgment that notation is culturally dependent. Just as one should allow for practices that demonstrate varying degrees of compatibility with Western notation, one should also recognize a practice that co-opts its schema to exceptional ends, ones seemingly incompatible with the apparent purpose of the notational model and yet fully dependent upon it. 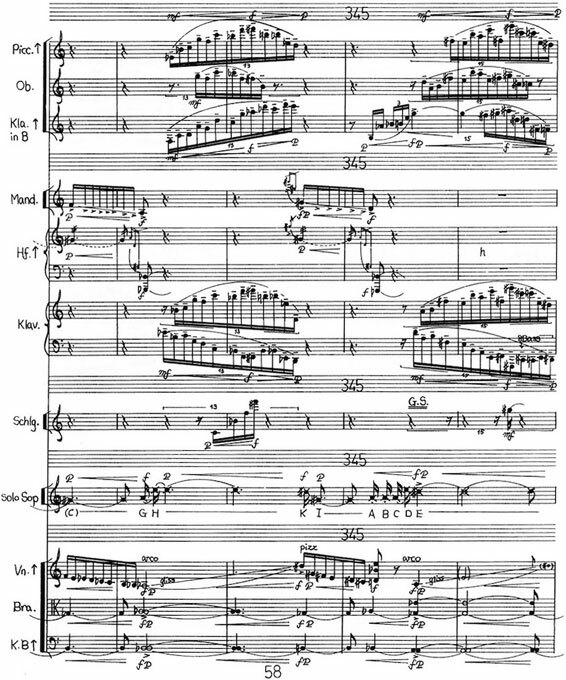 Ferneyhough appropriates notation and exploits its limitations. In doing so, musical objects encounter their own descriptions in a shared context: presence and pattern collide.Returning to the earlier quote of Siepmann, only in performance—execution—can notated gestures (possibly) reveal the extent of the composer’s intent. Emergence is similarly irreducible and—as in transduction—individual emergences feedback both on the part and the whole. If “positionality is an emergent quality of movement” (Massumi, 2002, p. 8), then the antagonistic but reciprocal arrangement of objects and the noisy simulacra that (would) displace them induces qualities—in the whole—not present in either alone. Put more elegantly, Morin (1999, p. 118) writes, “The whole is not only more than the sum of the parts, but the part of the whole is more than the part by virtue of the whole”. The concept of feedback is not new to this discussion. Bohlman’s representational paradox implies a likeness of feedback in the reciprocity between representations of self and other. Earlier references to Attali reveal a similar affinity with respect to a suggested sociocultural conditioning of and by music. Observed in the complex unit, feedback serves as both precipitate and catalyst conditioning the emergent qualities of the reactant objects prior to expression. The form these reactions act upon is the virtual one, one delineated not by an expressed quality but by an object’s indeterminacy—the totality of its possible qualities and actions. Indeterminacy is noise, and through interactions that may comprise “resonation or interference, amplification or dampening” (Massumi, 2002, p. 25), feedback shapes this noise. James Whitehead writes, “Noise is destructive and fatal unless a limit is applied” such that “noise in-itself […] effaces the possibility of any symbolism at all” (2013, p. 23). The invocation of every possibility prohibits the immediacy of any representation other than a reflexive one that remains virtual. Feedback mediates indeterminacy like a sieve—a lattice—through which the object’s field of potential flows. Once indeterminate, noise is now merely imprecise, limited. In a recursion of complexity, what emerges into the realm of signification is not just the expressed quality itself but also a description of that object’s imprecise state pre-emergence, a pattern encoded with the artifacts of this mediation. Illustrated with Cassandra, not only does the interaction of a musical object and its notated representation produce a new sonorous object to be read and interpreted, but with its expression comes a token, some account of its becoming. In the complex formulation, text and meta-text coincide. Language has “encoded within it, along many vectors, the presupposition of a human actor with agency, autonomy, and discrete boundaries” (Hayles, 1999, p. 252). Notably, this actor possesses an ability to act productively towards the expressive (affect), expression (communication), and the expressed (emergence). The composer serves as the apparent actor in most discussions of music. However, the role of the composer does not exclude other agentic presence from a work. Examples given in this paper show instances of noise assuming expressive agency. As an agent materially affecting a work, imprecision most readily acts within the complex unit. 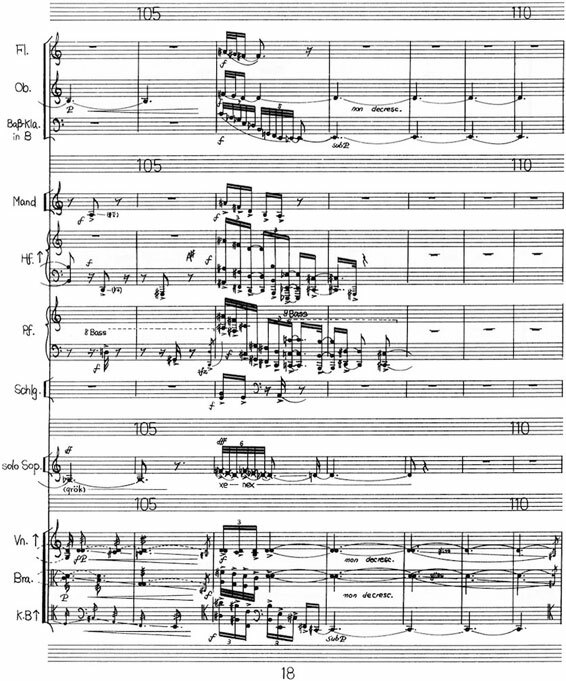 The preceding discussion of Ferneyhough’s Cassandra depicts how the notation’s purposeful subterfuge, its prescriptive imprecision, elicits—in execution—musical objects not apparent in the score. In a sense agency-by-proxy, the notated object nevertheless affects its context in a manner a static sign would not. In a more general sense, the feedback-recursion paradigm described above creates a sense of interactivity among instantiated objects. The emergences that result may exceed compositional forethought and thereby shed any predication of individual intent. However initiated, this process creates ever compounding strata of organization and all of the concomitant components thereof.Accepting for the possibility that noise as imprecision is nothing more than a structural conceit, an apt critique might offer that “structure is the place where nothing ever happens, that explanatory heaven in which all eventual permutations are prefigured in a self-consistent set of invariant generative rules” (Massumi, 2002, p. 27). In a paper that commences with an evocation of music’s social facets and an extract addressing its representational nature, the preceding discussion seems—generously—to be more of than about music. To redirect, a brief reading of Unsuk Chin’s Akrostichon-Wortspiel (1991–3)—hereafter A-W—provides an opportunity to follow a broader interpretive gaze, one that observes the multivalent noise embraced at this paper’s outset. In this work, Chin sets text by Michael Ende and Lewis Carroll issuing the subtitle, Seven scenes from fairy-tales for soprano & orchestra. Considered here, noise directly affects music, text, and the complex union of the two; noise also operates externally in regard to the textuality between Chin’s work and those of Carroll and Ende: Through the Looking-Glass and The Never-Ending Story respectively. These varying aspects of noise impart a masking effect on the composition as a whole. Noise effectuates opacity or distance in opposition to the scoring’s clarity and depth of stage—a matter for interpretation that will be addressed shortly. Chin’s choice of source texts sets the tenor of A-W but the treatment of intonation conveys the most immediate impact in performance. “To achieve a refined microtonality” (Chin, 1996), approximately half of the ensemble must raise its tuning by between one sixth and one quarter step in an uncoordinated, imprecise fashion. This effect imbues the harmonic field with a sense of noise and de-centers the salient focal pitches found throughout. Similar to Cassandra in terms of its ambiguities, this prescript assumes presence and in execution, its feedback conditions all other musical objects in the work. Returning to the texts, both Carroll and Ende construct fantastic worlds situated above undercurrents of disaffection, toil, and escapism. 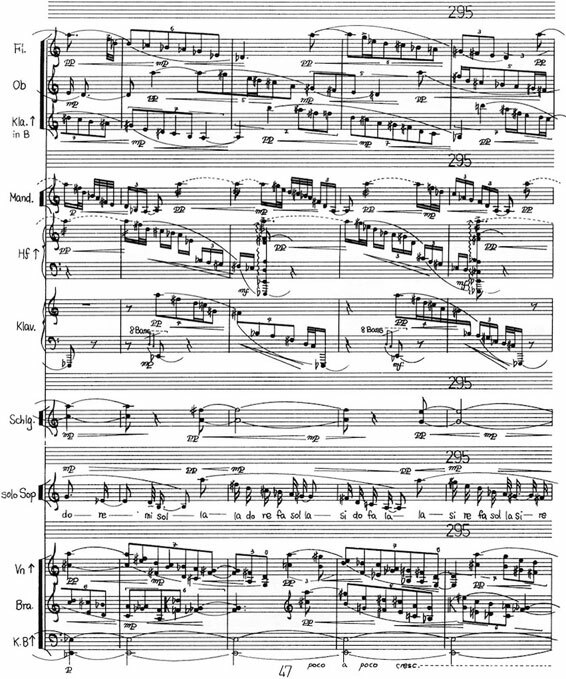 Accordingly, the sixth movement of A-W, “The Game of Chance,” consists entirely of random letter strings—nonsense—in lieu of words, phrases, or other higher-ordered structures. Chin’s musical treatment retains a sense of the monophonic, especially at the movement’s culmination. The woodwinds and piano share pitch content—shading the unison in a gradient of tone color—but this music does not coalesce into purposeful harmonic structures.Similar treatment of pitch content is observed in the mandolin, harp, and violin parts in support of the soprano soloist. With the instruments sounding in concert, these gestures require precise coordination. However, their rhythms strain against—or even disrupt—the movement’s prevailing metric organization. Akrostichon-Wortspiel by Unsuk Chin © Copyright 1995 by Boosey & Hawkes Music Publishers, Ltd. In this part of Ende’s story,From Chapter 23 (Ende, 2004, p. 388). the protagonist encounters a city of people who—absent of memory and language—endlessly cast letter-inscribed dice to no effect: a comprehensible message never emerges. While symbolic, the only symbolism here lies in the self-directed reflexivity of noise.The game of chance elegantly depicts indeterminacy in the virtual. The dice encompass all of an object’s possible qualities. As they tumble and flow, individual qualities—letters—become more or less immanent to expression. But lacking a linguistic model—structure—the object never actualizes this potential and it remains immaterial, silent. Chin’s setting forgoes any liberties laying bare the source and its allegory. In contrast, Chin chooses to manipulate other texts in this cycle. She writes, “Sometimes the consonants and vowels have been randomly joined together, at other times the words have been read backwards so that only the symbolic meaning remains” (Chin, 1996). These alterations put literary text, set text, and musical text in contention with one another. Accentuating the sonic over the phonic, Chin’s settings obfuscate their lineage and—contrary to her claim but within her design—dampen the invocation of all but the coarsest symbolism therein. A-W’s second movement, “The Puzzle of the Three Magic Gates,” also draws upon The Never-Ending Story.From Chapter 6 (Ende, 2004, p. 83). Chin recalls the character Artreyu’s passage through three gates or trials. In Ende’s story, two sphinxes stand sentinel at the first gate, the outset of the rite. This image—or some essence of it—figures most prominently in the movement as the text undergoes a mercurial decomposition. Chin isolates individual words, excises component syllables, and then mirrors,The second gate is a mirror: Zauber Spiegel Tor. juxtaposes, and concatenates textual elements. Extracting the end of the German plural for sphinx—Sphinxe— Chin mirrors its last two letters around the preceding “n”: “xenex.” This string accompanies a ritornello figure with a conjunct descent from F to D.Each numbered chapter in The Never-Ending Story begins with a successive letter from the alphabet. The sixth chapter begins with the letter F—the initial note of Chin’s ritornello figure and a focal pitch of the movement. The ritornello occurs harmonized and orchestrated in the ensemble throughout, and its recurrences variously accrue chromatic inflection and a bifurcating rhythmic diminution. In an intimate accord between soloist and ensemble, these flourishes inflect the already diffuse text they accompany—feedback in a complex unity. The movement concludes with a final utterance of “nex,” an image of arrested motion. The provocatively witty and subversive fifth movement of A-W, “Domifare S,” also warrants mention. This movement eschews an external literary source; in its place, Chin sets solfège syllables to the developing motto that recurs throughout the piece. Here, the composer directly makes information sonorous by joining musical pitch with its own descriptive patois. Initially aligned in the fixed-do system, each instance of the motto finds its corresponding solfège more thoroughly displaced. Moreover, as musical statements contract temporally, the textual lexicon expands from the diatonic to include chromatic solfège syllables. Individual occurrences of the descending motto ultimately wane in distinction. Instead, their heterophony contributes to a composite texture marked by polyrhythms and chromatic fluctuation. What Massumi (2002, 27) might call the “collapse of structured distinction into intensity,” discord makes itself more apparent—in the quality that emerges—by the nature of its discord. Each successive rupture between apparent signifier and signified generates more noise. Solfège’s schematic functionality fails, its limitation abates. What begins as a coy musical pun evolves into something solemn, and this sobriety has a musical correlate. Pedal bass tones underpin the Fortspinnung variations above; they progress: D–B-flat–E-flat–D. From a structural perspective, however, the bass can be heard as sounding: D–E-flat–D—an invocation of lamentation. Much more than happenstance, the lament motive makes a significant return in the seventh movement and prominently concludes A-W as a whole. The destabilization of intonation not only enriches the aural dimension, but it also variegates our conception of the whole by highlighting two distinct domains. As such, the salient pitch centers Chin composes lose their grounding. To analogize this with an acoustic fallacy, the soundscape phases between states. Reality wanes. A question unresolved, the soloist—an obvious surrogate for humanity—“fluctuates between these two tuning systems, depending upon which she is aware of at any time” (Chin, 1996). Just as the soloist seeks her subjective positioning, this reading of Akrostichon-Wortspiel similarly moves between engaging what the music represents and what it is representative of. Always in the ear of the beholder, representation is less a matter of “what one hears but of how one hears it” (Bohlman, 2005, p. 212). Subjectivity is inherent to intersubjective discourse. In response to a dialectical position on representation, this paper explores the potential for signification by contemplating the material aspect of objects, the scope of their presence, and the extent of their influence. A liberal interpretation of the invoked concepts informs this hermeneutic endeavor without avowal of fidelity to the orthodox. Noise in its various forms serves as a heuristic device, a component part of the larger complex formulation through which music is read here and representation proposed. What constitutes a reading depends upon the perspective of the observer. Therefore a measure of its success or failure is “radically perspectival and, ultimately, […] radically indeterminate” (Priest, 2013, p. 6). The multidimensional aspect of language that facilitates nuanced expression—musical or otherwise—can also inhibit it. In the image of the hologram, Morin also offers an element of allegory that recalls Georges Bataille. When a lucid interpretation fails to emerge or the apparent one seems inadequate or presumptive, the productive act of merely shifting one’s perspective can elicit salience from noise. ATTALI, Jacques. 1985. Noise: the Political Economy of Music. Translated by Brian Massumi. Minneapolis: University of Minnesota Press. BATAILLE, Georges. 1985. “Formless.” In Visions of Excess: Selected Writings, 1927–1939, p. 31. Translated by Allan Stoeckl. Edited by Allan Stoeckl. Minneapolis: University of Minnesota Press. BAUER, Amy. 2012. “The cosmopolitan absurdity of Ligeti's late works.” Contemporary Music Review 31 (2-3): p. 163–176. BOHLMAN, Philip V. 2005. “Music as representation.” Journal of Musicological Research 24 (3-4): p. 205–226. BOIS, Y.-A. 1996. “Formless: A User's Guide, Excerpts To Introduce a User's Guide.” October (78): p. 21–38. CASSIDY, Aaron. 2013. “Noise and the Voice: exploring the thresholds of vocal transgression.” In Noise in and as Music. Edited by Aaron Cassidy and Aaron Einbond, p. 33–53. Huddersfield, UK: University of Huddersfield Press. CELLA, Lisa. 2009. “Cassandra’s Dream Song.” The Flutist Quarterly 34 (4): p. 19–26. CHEN, Yi-Zhuang. 2004. “Edgar Morin’s Paradigm of Complexity and Gödel's Incompleteness Theorem.” World Futures: The Journal of General Evolution 60 (5-6): p. 421–431. CHIN, Unsuk, CAROLL Lewis, and ENDE Michael. 1996. Akrostichon-Wortspiel. London: Boosey & Hawkes. COX, Christoph. 2011. “Beyond Representation and Signification: Toward a Sonic Materialism.” Journal of Visual Culture 10 (2): p. 145-161. DUNCAN, Stuart Paul. 2010. “Re-Complexifying The Function(s) of Notation in the Music Of Brian Ferneyhough and the ‘New Complexity’.” Perspectives of New Music 48 (1): p. 136–172. ENDE, Michael. 2004. Die unendliche Geschichte. Vienna: Carlsen. FERNEYHOUGH, Brian. 1975. Cassandra's Dream Song. London: Edition Peters. HAYLES, Katherine. 1999. How We Became Posthuman: Virtual Bodies in Cybernetics, Literature, and Informatics. Chicago: University of Chicago Press. HELGESON, A. 2013. “What is Phenomenological Music, and What Does It Have to Do with Salvatore Sciarrino?” Perspectives of New Music 51 (2): p. 4–36. HIGGINS, Sean. 2010. “A Deleuzian Noise/Excavating the Body of Abstract Sound.” In Sounding the Virtual: Gilles Deleuze and the Theory and Philosophy of Music. Edited by Brian Hulse and Nick Nesbitt, 51–76. Farnham, Surrey: Ashgate. MASSUMI, Brian. 2002. Parables for the Virtual: Movement, Affect, Sensation. Durham, NC: Duke University Press. 1986. La Méthode III: La Connaissance de la Connaissance. Paris: Seuil. 1999. “Organization and Complexity.” Annals of the New York Academy of Sciences 879 (1): p. 115–121. PARK, Yong-wan. 2007. “Chin Unsuk At the Forefront of Contemporary Music.” Koreana 21 (4): p. 64. PRIEST, Eldritch. 2013. Boring Formless Nonsense Experimental Music and the Aesthetics of Failure. London: Bloomsbury Publishing. RICHARDSON, Michael. 1994. Georges Bataille. London: Routledge. SCHAEFFER, Pierre. 2004. “Acousmatics.” In Audio Culture: Readings in Modern Music. Edited by Christoph Cox and Daniel Warner, p. 76–81. New York: Continuum. SIEPMANN, Daniel. 2010. “A slight delay: agency and improvisation in the Ambient Sound World.” Perspectives of New Music 48 (1): p. 173–199. WATERMAN, Ellen. 1994. “Cassandra's Dream Song: A Literary Feminist Perspective.” Perspectives of New Music 32 (2): p. 154–172. WHITEHEAD, James. 2013. “Un-sounding music; noise is not sound.” In Noise in and as Music. Edited by Aaron Cassidy and Aaron Einbond, p. 11–30. Huddersfield, UK: University of Huddersfield Press. WHITTALL, Arnold. 2000. “Unsuk Chin in Focus: Meditations & Mechanics.” The Musical Times 141 (1870): p. 21–32. WISHART, Trevor. 1996. On Sonic Art. Edited by Simon Emmerson. Amsterdam: Harwood Academic Publishers. (USA) is a music theorist, composer, and technologist who finds inspiration at the intersection of disciplines. He holds composition degrees from the Berklee College of Music (B.M.) and Duke University (Ph.D.) and currently teaches music theory at The Ohio State University School of Music.